The NEW Smart Ramp has been designed for use with wheelchairs, power chairs and scooters. The ramps can be used to obtain safe access to motor vehicles, buildings and other inaccessible locations. 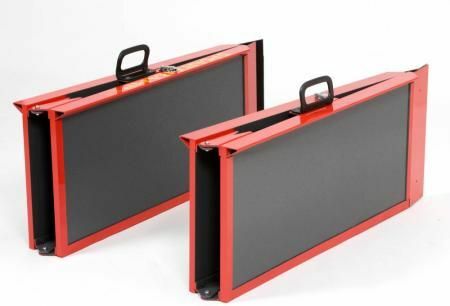 Lightweight aluminium construction Splits into two and folds in half for ease of storage and handling. Comfortable carry handles Anti-slip high traction surface Striking metallic colour finish. Smart by name, smart by nature! The clever, lightweight aluminium construction of the Smart Two Piece Folding Ramp has been designed to be used to obtain safe access to cars and vans, buildings and other previously inaccessible locations. This smart wheelchair ramp splits in two, folds in half and has a comfortable briefcase style carry handle for ease of storage and handling. 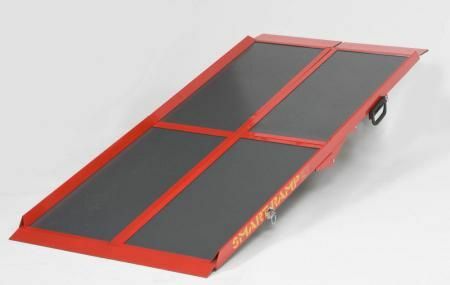 With its anti-slip high traction surface and a safe working load of up to 200kg (31 stone) this is also a smart scooter ramp and smart power-chair ramp!The Smart Ramp has a generous 76cm width and when folded out it is 6ft in length. Bought this ramp to put my scooter in the car, its lightweight and easy to use and it fits alongside my scooter in my car. I would recommend it for this use. Well worth the money . Excellent portable ramp , lightweight and suits our needs , I would definitely recommend if you need a good strong portable ramp. Really good sturdy ramp, yet also very portable too. 5 stars.